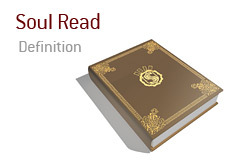 What is a "soul read"? What is the definition of the term "soul read"? In poker, a "soul read" occurs when a player makes an unbelievable play (usually an unbelievable call) based on a "read" that they claim to have on their opponent. "I looked into his soul and knew that he was bluffing, so I called." 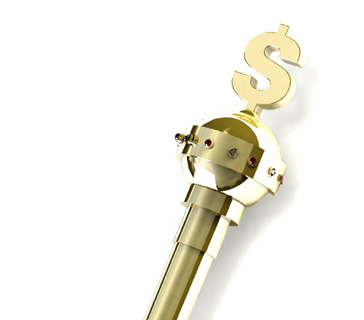 Let's look at a few examples of a "soul read" in poker. The action is checked to you on a board of Ad-Qd-Kd-2s-8s. There is just one other player in the hand. Your opponent has checked/called every street. You toss out a 3/4 pot river bet. Your opponent snap-calls and turns over 6d-6s for a pair of sixes. You meekly look down at your 2s-7d and muck your hand. Your opponent mutters something about a "soul read" and collects his chips. With the board reading Ad-As-Qd-Qd-2d, your opponent pushes all-in for the last of his chips. It's a substantial bet, and you would be committing more than 50% of your remaining chips if you choose to make the call. You look down at your cards - King high! You think that your opponent is bluffing so you decide to throw in a call. Your opponent turns over a pair of Fives, and you take down the pot with two pair, Aces and Queens with a King kicker.